Gain Control Over Your Career. Become A Driving Instructor. Driver Trainers at Trent experience the best remuneration and working environment in the industry. We are constantly on the lookout for people to join our team and add value to our company. If you have valuable skills, are an excellent communicator and would enjoy training young people to drive safely, then please fill out our application form. No prior driver training experience is necessary as Certificate IV training is available through our course provider, Trent Education. Ltrent driver trainers enjoy the highest level of job satisfaction. Creating safe drivers is great work. Our 54 step curriculum combined with the industry’s best trainers sets us apart from other driving schools. 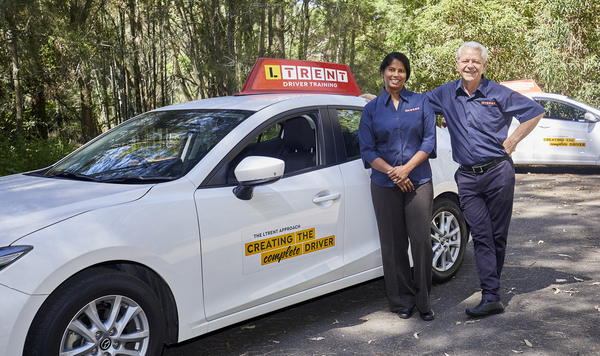 As a LTrent Driver Trainer you will have access to the Trent Method of Driver Training, which has successfully helped over 300,000 students become safer drivers. This features the learn to drive handbook, student record card, lesson plans, training materials and instruction topics. This is supported by your own online booking and planning platform. Working with the best brand in driver education means that the new students come to you. LTrent has a sales and marketing system designed to introduce new students to you. With a suite of online and traditional marketing channels LTrent attracts more learner drivers than any other driving school. The initial training that you will receive means that you end up with a Certificate IV in Transport and logistics and a driving instructors licence. In addition to this, you will be trained to teach the Trent method as well as how to operate as a successful instructor. LTrent driver trainers receive the highest level of support. We have a dedicated customer support team to help you manage your students. You will have live access to our online diary and lesson planning system. You will also have the support of an area assistant to help you achieve success. LTrent has been creating the world’s best drivers since 1969. We’re in the business of designing and delivering the very best driver training curriculum. The Trent Method is the curriculum of choice for thousands of drivers. Our students enjoy a pass rate 28% higher than the state average. If you have a can-do attitude, are an excellent communicator and would enjoy training young people to drive safely, then don’t wait. This is the opportunity for you! Wouldn’t it be great if you had the flexibility to work whenever you want? With LTrent, you can. No prior experience required. We’ll provide the training and support every step of the way!